Aries November 2018 Horoscope predicts that career and outward ambitions will be in focus this month. More than 90 per cent of the planets are in the northern sector of the horoscope. Family issues and psychological matters can be in the background. Aries zodiac sign are highly ambitious and look for improvement of status. Planetary strength is in the western half of the chart. Aries personality has to cut down aggression and accomplish things through collaboration with others. Social skills are important and you have to adjust to people and situations in November 2018. There is no need for exerting yourself too much, and you should allow others to take care of things. In November 2018, things are happening with divine intervention and this is a highly joyful and lucky period. You have to accept whatever is happening with humility and everything is for your good. There will be great prospects in the areas of finances, spirituality and relationships, and your understanding in these fields will be phenomenal. 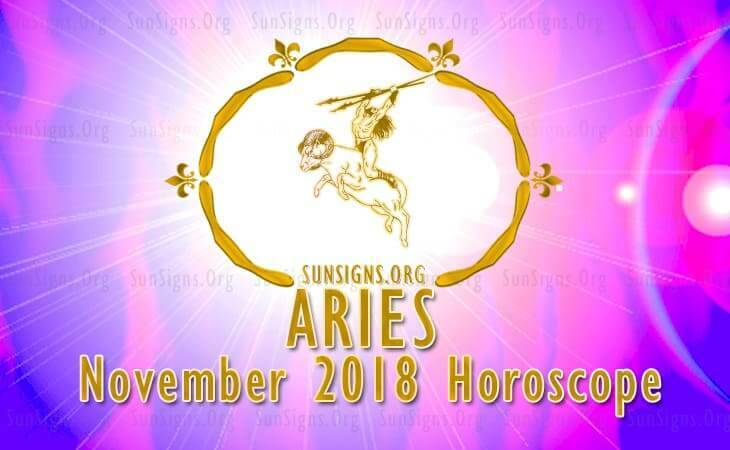 Main areas of interest for Aries star sign in November 2018 are love and sensuality, spiritual and intellectual advancement, overseas travel, getting rid of undesirable things, and reformation. 2018 horoscope for Aries foretells that with the influence of Venus, there will be very good prospects for career development. Family members and seniors are helping your professional success. There will be promotions and pay rises. Zodiac predictions for Aries in November 2018 predict an excellent month on the financial front. Presence of financial planet in Sagittarius will result in great fiscal growth and you can set high targets. Speculative investments will be profitable and money can be made from overseas investments with the help of foreigners. You have enough money to spend lavishly. November 2018 Love Horoscope indicates that singles will find love overseas with foreigners or in spiritual centers. You are looking for an intelligent and educated person. Spiritual people also interest you, and you may get involved with seniors and mentors. Get more information from Aries sexuality. Problems in Aries compatibility of married people can be overcome by spending time together in scenic places, or in spiritual places and seminars. November 2018 monthly horoscope for Aries predicts that health will be wonderful this month with plenty of energy. After the 23rd, it will improve further. Resorting to healthy diet and physical fitness routines should be done before the 24th. Aries November 2018 monthly horoscope forecasts a fabulous period for health, career and finance. Love relationships of married people require careful handling. Chinese Horoscope 2018 can give more help.